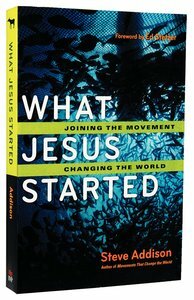 About "What Jesus Started: Joining the Movement, Changing the World"
Steve Addison has been a life-long student of movements that renew and expand the Christian faith. Steve distills the characteristics of dynamic movements and makes them available to leaders committed to the multiplication of disciple-making churches.Steve began his research into Christian movements in the late 1980s while serving as a church planter in Melbourne, Australia. He carried that interest into his Doctor of Ministry with Fuller Seminary.Steve currently serves as Director of Church Resource Ministries (CRM) Australia, a member of the CRM global community. CRM empowers leaders for the church.Steve loves walking, historical novels, Shakespeare, anything written by G K Chesterton or C S Lewis, Sunday afternoon naps, watching Australia beat the Poms at cricket, and supporting the Collingwood Football Club.